n’s choir performed their weekly welcome, which they do by singing and marching up the center aisle at a rhythmic cadence. The Bishop, and preacher for the day, was dressed in the purple vestment reserved for bishops and sat in the purple-clothed oversized chair in the front of the church. When he preached, the chaplain stood behind him holding an Episcopal staff, or shepherd’s crook. Before the children sang, it was the time for welcoming visitors. On my second day in South Sudan, I was one of four visitors to the church. We were each given an opportunity to introduce ourselves. Not knowing exactly what to do or expect, I stood furthest from the podium, hoping to speak last after learning something from those who spoke before me. The first woman introduced herself speaking in Bari, the language and tribe of the most people in the Diocese of Rejaf. At the time, I didn’t know a single word in Bari, so I was not able to learn anything from what was spoken. However, the response to what was spoken was altogether educational. The people, elated at the presence of the visitor, responded by playing music and jumping up and down to the music’s beat. One woman from the choir approached the visitor, grabbed her hand, and they began to jump up and down together. The smiles on their faces, the yelling (done by women as they shout while rolling their tongues in a way that produces a jubilant sound), and the festive music created a joyful symphony. They repeated this singing and jumping at the introduction of each visitor, until finally, the cathedral Dean asked the people to allow the service to continue. This was the first time I witnessed (I didn’t participate that day) the people jump in celebration. Since then, I’ve witnessed and participated in the jumping many times. When I visit a village, the people are expecting their “son from America”, or “the Kawaja[white or foreigner] doctor”, or “American evangelical miracle healer”. Of these titles, “son from America” is my favorite and by far, the most accurate description. Whatever it is they are expecting, when I arrive, the reception is extremely warm. Oftentimes, a group of children will wait by the roadside until they see the Community Health Education Program vehicle arrive. When the children spot the vehicle, they run back to the village to inform a smiling and singing delegation gathered to welcome me and signal the beginning of the program. When the vehicle reaches the delegation, everyone exits the vehicle (except the driver, of course) and joins the procession to the church. When we reach the church, the children lead the congregation of people in drumming and singing, while the men and women greet me with handshakes followed by an invitation to jump along with them. After we’ve jumped together, the people are happy, I’m happy, and the program can start. Sometimes, after the program, music is played and we jump again. The people always like it when I jumped with them because it means that I have joined, or accepted, them and their customs. I like jumping because I can’t believe I’m doing in the continent of my ethnic origin, 7000+ miles from home. 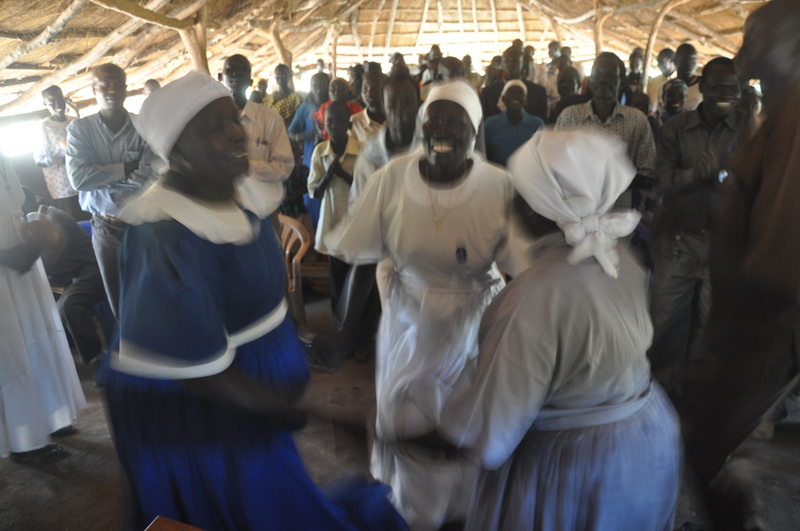 In the first picture below, the woman I’m jumping with is a Canon in the Rejaf Diocese, named Canon Gisina. She is still the primary leader of this particular congregation. I’ve been told that she led and built up the church during very difficult years of war. The second picture is a group of women jumping in area called Kondokoro. I gave a talk once about ways people could prevent themselves from some of the more common illnesses found in a particular village. After I finished, an old man and preacher stood up, signaled to the choir to begin playing music, started jumping up and down, and said, “Now lets us practice the medicine for rheumatism [arthritis]!” We laughed and acknowledged that a good dance is certainly great medicine. 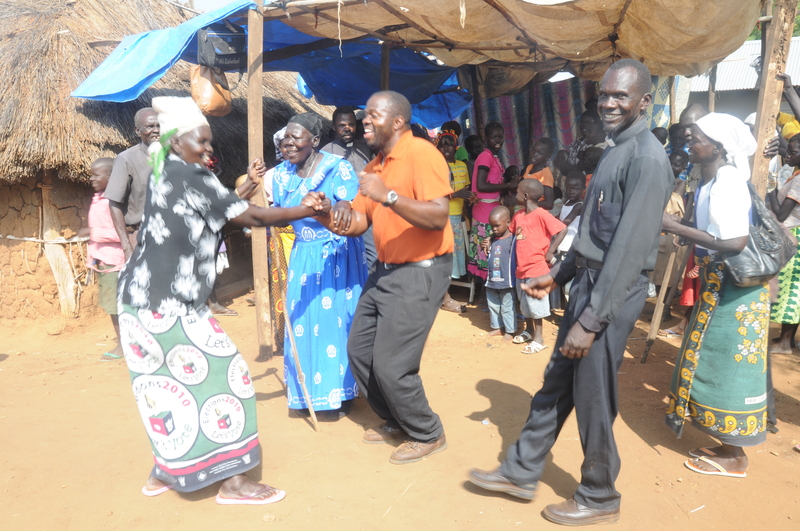 This entry was posted in cultural and tagged African, Bari, culture, dancing, Duke, ECS, joy, Juba, jumping, missionary, missions, NGO, program, Rejaf, South Sudan, village. Bookmark the permalink. You mean you’re not the American evangelical miracle healer? (LOL) When you describe the jumping it reminds me not only of the joy they find in receiving visitors but also the freedom they possess to praise God openly and with all their being. It reminds me of David’s undignified praise. How wonderful! I’m glad to hear that you are receiving such a wonderful reception. No doubt the people of South Sudan recognize a blessing from God when they see it! Thanks Sanetta, they do praise freely and welcome openly. That’s what makes South Sudan easy to love! I love her skirt! I wonder if this is a good way to get messages out in the community – people WEARING the message like this “let’s vote” message. What if we were to distribute cloth with appropriate messaging? What would that look like? Thanks Darriel for these pictures and the updates! Allegra, creative idea. I’ll have to look into that. We’ll need someone to print the material, and then have the material distributed. I message like “Wash Hands with Soap” may go a long way. I love this! What a great tradition! Good to see some Mothers’ Union uniforms there!! Oh how wonderful to be free to express joy so enthusiastically… I would love to jump for joy at church or anywhere. It is a joy to be free. It’s a lesson for us.